The Tree of Life is the representation of a tree symbolising divine wisdom; and as such it has appeared in many different cultures across the world. In the Garden of Eden, as recorded in the Old Testament, the Tree of Life represented immortality. In other cultures it has symbolised Deities, Holy Scriptures and the Force of Nature. Many different species of tree account for these symbols, but the oak predominates. 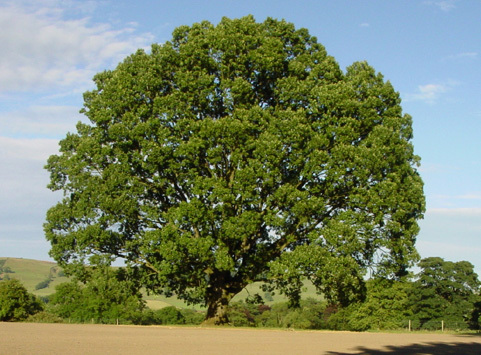 In Britain the oak tree has been revered through many different ages and by many different peoples, such as Druids, Pagans, Christians, Romans; and still today it is widely regarded with awe and reverence as the noblest of trees. This is due in part to its fine stature and strength, its deep roots and ability to withstand the battering of storms, to its legendary longevity, but in addition to all these qualities and perhaps most importantly is its pre-eminence as a habitat for other creatures: it is said to provide a home for over 500 different species, from birds and mammals down to insects.